It is rare chance that such a person as Craig can touch your life and become instant friends and brothers. Craig Polzin was a consummate soldier, instructor and leader. One of the most caring men and, he cast a broad and protective circle around those he loved. Craig Allen Polzin, age 60, passed away Sunday December 6th, 2015 at his home in Kennesaw, GA. He was born on April 29, 1955 in Syracuse, NY to Earl and Velma Marshall Polzin. Craig grew up in Colton, OR and Palos Verdes, CA. He graduated in 1973 from Colton High School in Colton, OR. After high school he joined the Army in 1979 and served for 21 years. He retired as First Sergeant and served in 1st Battalion, 50th Infantry, Ft. Benning, GA, 2nd Battalion 75th Ranger Regiment, Ft. Lewis, WA, and the 5th Ranger Training Brigade, Dahlonega, GA. Craig was the recipient of the Ranger Tab, Air Assault Badge, Expert Infantry Badge, Pathfinder Badge, Jump Master Badge, Meritorious Service Medal, National Defense Service Medal and was a Graduate of Sergeant Major Academy. He retired in 1994, achieving the rank of 1SG. While in the military Craig attended Troy State University where he received a bachelor's degree in Business. After retirement, he began a career in the field of Production Management in the food industry, working for companies such as Dolly Madison, Schwann's, and Presidents Bakery. Craig was a member of the U.S. Mountain Ranger Association, the American Legion, and Sons of Mosby. 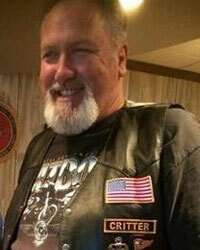 He enjoyed riding his Harley, hanging with his Ranger buddies, spending time with his grandchildren and his pup Bailey.